We never use ready made designs (templates) and that is why your website will never resemble with any other websites on the net. We create designs that exactly reflects your industry, company theme and colour scheme your company follow. Our designers do good home work before starting any project and that produces results. After completing the website we optimize it for search engines and assure better rankings on major search engines like Google, Yahoo, MSN etc. 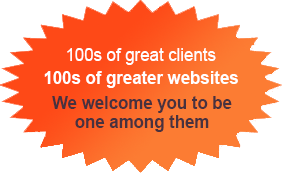 AFTER COMPLETING THE PROJECT; WE HANDOVER YOU THE 100% CONTROL OF YOUR WEBSITE. We send you the whole website zipped and handover any user ids and passwords associated with your website. This is just to address your concerns. We are always there to assist you on your website related issues. Our works guarantee results (businesses / clients).